Firstly, why would you want to sterilize jars for all your lovely preserves? Just because a clean sterilized jar is essential to the success and longevity of the jams and preserves you spend a lot of time making. Sterilizing is a crucial part of preserving to remove any bacteria, yeasts or fungi thus protecting the food you put into the jar. Dirty or jars not correctly cleaned will infect the food inside, and it will spoil very quickly. Sterilizing is a quick and easy process so therefore should never be omitted. 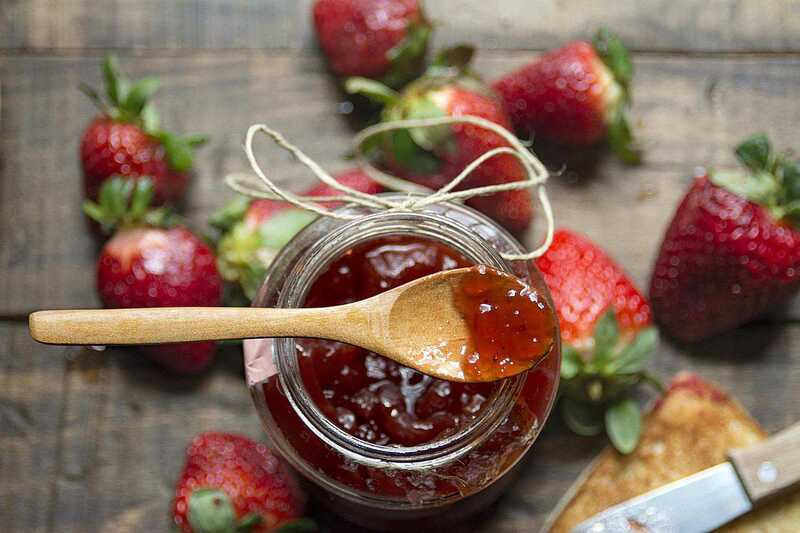 Here are simple ways to achieve a proper sterilization and make all your efforts at jam making, bottling and canning a success. Do NOT add cold food to hot jars, or hot food to cold jars; otherwise, the jar will shatter which is very dangerous. This method is the most trusted method for ensuring your jars are scrupulously clean for your preserves. It takes slightly longer than the other ways but starts the process about 30 minutes before your preserves are ready to pot and you will not even notice the time. Heat the oven to 130C/ 275F Do not be tempted to heat the oven any higher, or you may risk the glass breaking. Lay a double layer of newspaper on each oven shelf but not the floor of the oven. If you are using a gas oven, make sure your newspaper is well away from any flame. If it is on a middle shelf, you will be fine. Arrange the jars on the oven shelf, making sure the jars are not touching each other. Close the oven door and sterilize the jars for a minimum of 20 minutes. Using thick oven mitts, remove each jar from the oven as needed onto a heatproof mat or heat pad, making sure you fill while the jam or preserve is as hot as the jar. Fill your dishwasher with clean cold jars and run a minimum or rinse wash to time the ending with when your jam, preserve or pickle will be ready. Use the jars one at a time from the dishwasher needed making sure you fill while the jam or preserve is hot as is the jar. 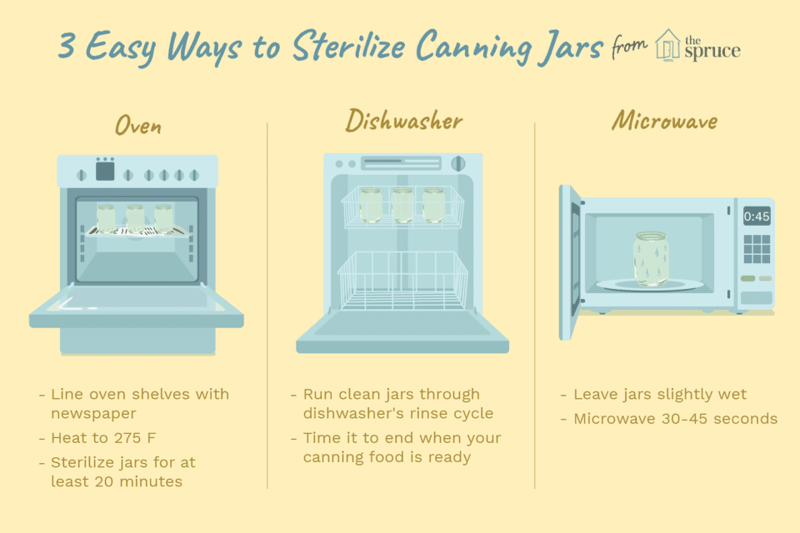 This method of sterilizing is good for regular jam jars but not the Kilner-style or for metal lids. Clean the jars as normal, rinse but leave the jars a little wet. Microwave for 30 - 45 seconds depending on the size of the jar. I recommend not using old jam jar lids if they are damaged or rusty, they should be thrown away as they may not make a good seal. Instead, use wax discs and cellophane or buy new lids. As already mentioned above, do NOT add cold food to hot jars, or hot food to cold jars. Do not use old jam jar lids if damaged or rusty, they should be thrown away as they may not make a good seal. Instead, use wax discs. Remove jars from the oven or dishwasher only when needed or they will cool down too much. Always sterilize more jars than you think you will need. Should you have more mixture than anticipated it is too late to start sterilizing once the food is ready. Leave jams, preserves or pickles to settle for 15 minutes before sealing.